Who's to say the wheel can't be reinvented? Well that's exactly what a Canadian team has done for the next lunar rover. The new Canadian rover will be used during lunar exploration for drilling and excavation, carrying payloads, cargo and crew and feature hi-tech communication systems. Professor Peter Radziszewski, a mechanical engineering professor at McGill University in Montreal and a team of professors and students will compose the team after they won a $11.5 million contract to design the wheels. 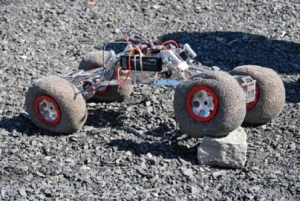 It was during a sabbatical at the Canadian Space Agency that Radziszewski began his work investigating tractions systems for potential space rovers. If you recall, it was also Canadians who designed the "Canadarm", a mechanical arm that extends from a cargo bay of the space shuttles. The wheel will be able to conform to rigid surfaces on the moon, something the Americans did with older technology in the 60s when Neil Armstrong step first foot on it. Radiziszewski has turned to the mining industry looking for ideas because it's simply not possible to use rubber and air in space and on such rugged surfaces.